You don’t need celebrity status to be a force for good–you, too, can make a difference in many of the same ways actors, athletes, and other high-profile people do. Here’s how to get started. On January 12, all retailers and manufacturers that do business in California will be required to publicly disclose their efforts to eradicate slavery and human trafficking from their supply chains; actress Julia Ormond was one of the key forces behind passage of the new legislation. 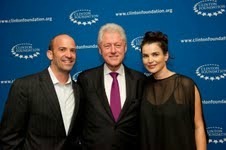 “Julia Ormond, a tireless humanitarian activist and founder of the Alliance to Stop Slavery and End Trafficking (ASSET), was absolutely instrumental in the passage of California’s landmark legislation to combat labor trafficking through transparency in business-supply chains,” said U.S. Representative Chris Smith (R-NJ), a longtime champion of human rights. Ormond, along with many other celebrities and athletes, leverage their recognition and put in time and effort to change the world. But you don’t need celebrity status to be a force for good–you, too, can make a difference in many of the same ways that these major media stars do. 1. Choose a cause that you are passionate about. 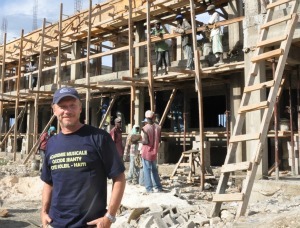 “Focus your contributions on one place,” said Paul Haggis, Academy Award winning screen writer and director, who founded Artists for Peace and Justice (APJ) to provide an education for impoverished children in Haiti. In a private interview, he urged that people know where their money is going and that the funds are well managed. Haggis was inspired by the work of Father Rick Frechette who had worked with the poor in Haiti for 25 years when he and Haggis met. APJ built elementary schools and now the first public high school in Haiti (with Haggis, pictured right). Haggis has raised millions of dollars for APJ, often by inviting friends to parties in his home. He has also taken friends on trips to Haiti to meet Father Rick, see the schools, and meet the children. 2. Think about the variety of ways you can help. “A day doesn’t go by that Stephen Colbert doesn’t do something for DonorsChoose,” Charles Best told me over a recent lunch. Best is the Founder and CEO of DonorsChoose, an online charity that makes it easy to help students in need through school donations. Colbert serves on the board. Best explained that every evening, Colbert gives a DonorsChoose gift card to his Colbert Report guests. The gift cards, for which Colbert has already paid, gives guests an opportunity to go online to choose where the contribution will go. The idea is that once guests start looking at the teachers and their requests on the DonorsChoose site, they will continue giving on their own, and perhaps even start giving gift cards themselves. You, too, can give DonorsChoose gift cards to business clients, friends and family. There is also a lesson here for board members to think about how you can be useful, every day, to the organization where you serve. 3. Protect your nonprofit organization and the people it serves. Morton’s advice to his clients is equally relevant to any one of us who serve a nonprofit board. Buy gift cards for your clients, friends, and family members on DonorsChoose or GlobalGiving. It will take a matter of minutes and might be among the most rewarding and lasting presents they receive. Choose a cause that is personally meaningful and a nonprofit that is effective in its work. Give your support through charity and volunteer service. Invite friends to a party at your home to ask for contributions to your charity. Even better, invite them to visit the organization you support and to contribute. Become aware of companies that are attentive to their social and environmental practices and vote with your wallet–as a customer and investor. For those of you who serve on nonprofit boards, ensure that the board is engaging with legal and fiduciary experts to understand and fulfill its oversight responsibilities. Looking for new ways to give back? Help fight slavery and trafficking by contributing here and following ASSET on Twitter @assetcampaign. 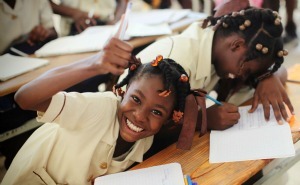 Help provide an education for very poor children in Haiti by contributing here and following on Twitter @artistsforpeace. Help young people to have greater opportunities in life by donating here and following @bryanclay on Twitter.